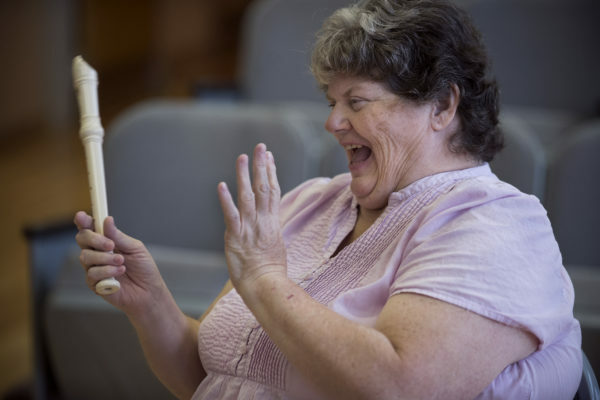 Mary Parker laughs at her own mistake while playing a recorder at the Somerset Place in Brewer Monday. 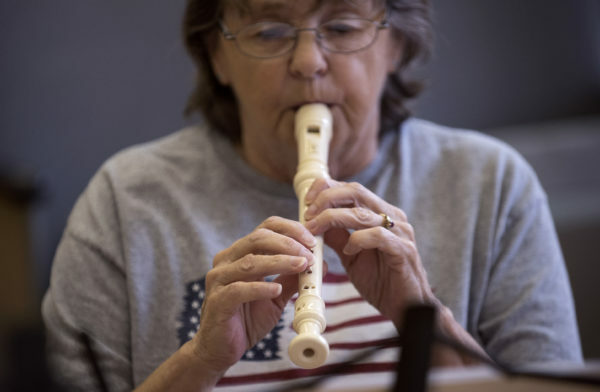 She was among the participants of a class teaching seniors to read music and play the recorder. Esther Roberts (from left), Sheila Swazdowich, and Mary Parker play their recorders at the Somerset Place in Brewer Monday. 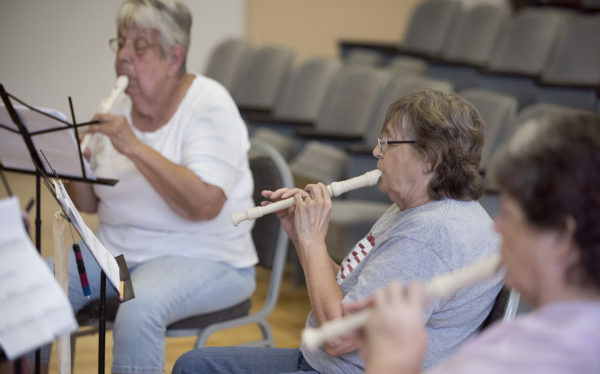 They were among the participants of a class teaching seniors to read music and play the recorder. 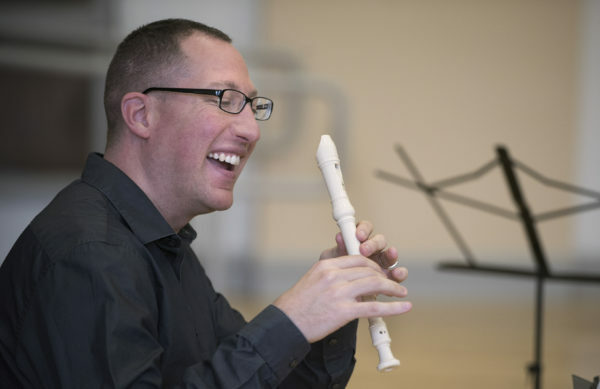 Philip Edelman an assistant professor of music education at the University of Maine talks to participants of a class while teaching seniors to read music and play the recorder in Brewer Monday. Philip Edelman an assistant professor of music education at the University of Maine (center) talks to participants of a class while teaching seniors to read music and play the recorder in Brewer Monday. “I have always loved music, and this sounded like it would be fun,” said 60-year-old Mary Parker. A native of Bangor, Parker grew up in a big family. “We always had a piano in the house, but with seven kids my mother didn’t have time to teach us to play,” she said. Other than studying clarinet in third grade, she never had any formal musical training. That is, until last winter, when she signed up for the free weekly recorder lessons being offered at Somerset Place, the former Brewer Middle School that was recently rehabbed into affordable housing for seniors. Parker was one of about eight Somerset Place residents who enrolled in 12 weeks of lessons, along with another group of residents at a different site. 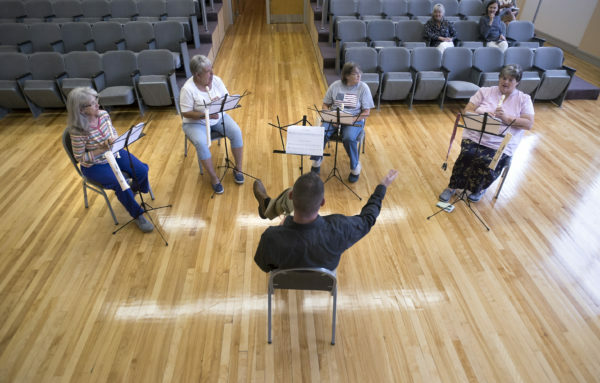 On a recent Monday afternoon, Parker and two other women — 74-year-old Esther Roberts and 65-year-old Sheila Swazdowich — reconvened after a break of several weeks with instructor and researcher Philip Edelman, who teaches music education at UMaine, to see if the skills they learned and practiced had stayed with them. Seated in a semicircle in the handsomely restored middle school theater, the group tackled simple, familiar tunes, including “Mary Had a Little Lamb,” from a slender packet of printed melodies on their music stands. “Let’s finger it,” Edelman said, demonstrating the starting position on his recorder. The women followed his lead, lifting and lowering their fingers silently on the barrels of their plastic instruments as they spoke the notes, then playing the tune in unison. Then they moved on to “A Tisket, A Tasket,” “Jolly Old St. Nick” and “There’s a Hole in the Bucket,” all notable for their familiarity and simplicity. There was a lot of laughter, and a palpable air of pride in the room as each piece concluded. “Up until recently, there was this common misconception that if you didn’t get into music as a child or join the high school band or the middle school chorus, that was it for you,” Edelman said in an earlier conversation. But more recently, he said, educators and researchers have discovered that adults at midlife and older can learn to perform and enjoy music, even if they have no previous exposure or if it has been many years since they last picked up an instrument or sang in a group. Edelman, who particularly enjoys teaching older adults, pointed to the work of the New Horizons International Music Association, which promotes the personal and social benefits of learning music later in life and the growth of community orchestras and choral groups that feature late-blooming performers. “Their goal is to provide another entry point into music for older adults,” Edelman said. In this case, though, the goal is also to understand more about the specific effects of learning music on the cognitive health of older adults. That’s why Edelman is partnering with Rebecca MacAulay, UMaine assistant professor of clinical psychology, in this pilot study. “As all of us age, we have more trouble with multitasking,” MacAuley said. “And everyone’s greatest fear is that moment when you question whether you are not aging normally.” Mild cognitive decline and the onset of dementia can signal the loss of independence and a change in lifestyle, she said, but activities that stimulate the brain, challenge problem-solving and promote socialization are thought to be protective against those losses. Learning to read and perform music, MacAulay pointed out, calls for assimilating the abstract language of musical notes and theory, translating it to the physical action of playing an instrument, learning to read and play at the same time, paying attention to the musicians around you and developing skill and muscle memory specific to your instrument. When she and Edelman met last fall at an orientation event for incoming faculty, it didn’t take long for them to identify their shared interest in working with older learners and to start developing the outline of the Maine Understanding Sensory Integration and Cognition (MUSIC) Project. With start-up funding from UMaine’s internal research fund, the two researchers purchased inexpensive plastic recorders, among the simplest of instruments to play, identified appropriate musical selections and assessment tools and recruited participants from the Brewer Housing Authority, which has partnered with UMaine on other aging-related studies. Residents who expressed an interest completed a baseline assessment of memory, attention, information processing, mood and other indicators of cognitive function. When the music lessons conclude — the duration of the “intervention” has not been determined — the participants will repeat the assessment. As MacAulay and Edelman prepare to recruit a new and larger group of participants to start lessons this fall, including older adults not associated with Brewer Housing Authority, they will also establish a control group of adults who will listen to and study music without learning to read or play an instrument. “We expect to see benefits in concentration and working memory function” in the hands-on group, MacAulay said. Students from both departments will also participate in teaching music and administering the cognitive assessments. The researchers are also developing their own teaching manual, geared to the specific needs and interests of their older students and to the standardization needs of the MUSIC project. For the women practicing their new skills in the Somerset Place auditorium, learning music is its own incentive. “This is way more fun than we thought it would be,” said Sheila Swazdowich . “There’s a real sense of accomplishment,” added Mary Parker. “And you couldn’t find a better teacher than Philip,” said Esther Roberts. They all said they enjoyed the social aspects of the group lessons and practices as well as the quiet satisfaction of going over a new tune or technique on their own. The hardest part? “I have arthritis in my fingers and carpal tunnel, so sometimes it’s hard to hold the instrument,” Roberts said. Heads nodded, but a little Tylenol, they all agreed, worked wonders. Bangor-area readers interested in participating in the MUSIC project this fall may contact Rebecca MacAulay at rebecca.macaulay@maine.edu or (207) 581-2044. Correction: Philip Edelman’s last name was misspelled in two captions in a previous version of this story.